Happy Friday! Can you believe it’s already July 4th weekend? This summer, especially this week, has flown by for me. In case you missed it, Kinzie Claire was born last week and we have been adjusting to a new life with 2 kids. So far, it doesn’t involve a lot of sleep or extra time so I’m sharing a little craft project from last years birthday party for my daughter Taylor. Taylor was born on the Fourth of July which gives us an easy and fun party theme for her birthdays. For her 1st birthday last year, I made her a cake topper that says “ONE” and you can make this say anything really. It was so easy that I had to share the details! I will definitely be making more of these in the future for holidays and birthdays. Perhaps even one for Taylor’s 2nd birthday this Monday! I just recommend keeping the wording short so it sits nicely on your cake (or use smaller squares for longer words). I started by cutting the white paper. It’ll make it easier if you draw out one square (make sure all letters fit in that square! ), then use it as a stencil for the others. Just stick the letters on the white paper and glue on the decorative background paper of your choice. Then fold the paper back so it can sit on the string and add a little glue so the fold stays. 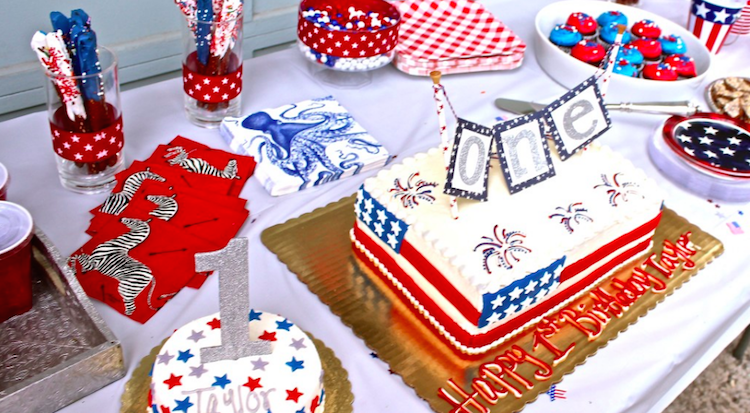 For more 4th of July themed party inspo, check out Taylor’s Red, White & Blue Birthday Party post! I hope these directions made sense (I’m running on maybe 2 hours of sleep!). Have a great weekend! This is so cute! Thanks for sharing, I can definitely use this for a fourth of july party or a 4th themed birthday! Thanks Angela! It was so easy that I had to share 🙂 Please share a pic with me if you do make one!